On a watch that had stopped six months after the shots that had got him in the box." — Lupe Fiasco, "The Cool"
Bob's come Back from the Dead! The only problem is that it took several days/months/years to happen, and nobody was expecting him to need a way out of the ground. With nowhere to go but up, he starts clawing his way out, eventually making it out. Basically, any scene where someone comes back to life inside a coffin and has to dig their way out of the ground. These days, it's pretty much the standard practice for zombies and vampires (or at least the first ones to start spreading the undead plague), but it's especially notable when it happens to normal folks, who seem pretty horrified at the act and certainly weren't expecting to have to do it themselves. Depending on the character, the reason for doing this varies. Bob may have been thought to have been dead, and was Buried Alive, or perhaps he was given a second chance a bit too late, and had to get out the hard way. Note that you shouldn't expect this to be possible in real life: Six feet of dirt are heavy. Also, go to any modern morturary. Anything breaking out of those metal streamlined megaboxes we call coffins these days had better have Super Strength. Not to mention that even if you could escape from a box under six feet of dirt somehow, it still wouldn't result in the usual sight of a hand popping out of the ground: instead, the displacement of all that dirt would result in a huge mound popping up ahead of you. See Also: Buried Alive, Back from the Dead. Sango, from InuYasha, after being apparently fatally wounded, is Buried Alive in one episode. Rather than dying from bloodloss and lack of air, she just gets mad and digs her way out for revenge. With a little help from a magical pain-killer, she then proceeds to hike for miles and then engage in heavy combat and nearly defeat Inuyasha. In MÄR, Chess Knight Phantom comes back to life in this way; all his Knights gather by his grave to witness his hand burst out of the soil as he resurrects. One wonders why they buried him, if they knew he was going to resurrect. Outlaw Star has Shimi drag himself from the makeshift grave Gene and co dug him in episode 15. Dragon Ball Z: When Earth's Dragon Balls revive all of Freeza's victims on Namek, Vegeta claws his way out of the grave Goku dug for him. As the entire planet is crumbling into a lava-ridden wasteland thanks to Freeza, he's briefly unsure whether he's alive or in Hell. Goku: Guess it's a good thing I didn't bury you that deep after all. 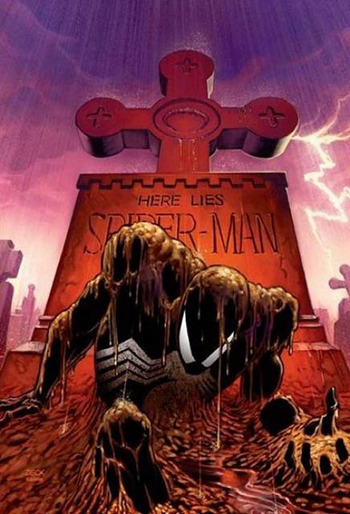 Spider-Man, "Kraven's Last Hunt": Kraven drugs Spider-Man, buries him alive, then puts on the spider costume and starts trying to be Spidey as part of his attempts to prove his total superiority. Meanwhile, Peter regains consciousness and, driven by his feelings for Mary-Jane, busts his way out. Jason Todd did this after Superboy-Prime punching reality led to his resurrection, using only his fingers and a belt buckle. Batman himself too, at the climax of the RIP storyline. "Straitjacket's kindergarden. Locks, too. Benchpressing a pine coffin lid through 600 pounds of loose soil that's filling your mouth, crushing your lungs flat and shredding your dehydrated muscles? That's harder...But far from impossible." Superman did this in one story after having apparently been killed (and insta-buried) by Terra-Man. Since he retained his powers, it was not a very surprising feat. The twist set up by the villain was that he came back looking like Terra-Man, leading him to be hunted by other superheroes for obvious reasons. In Power Girl (Volume 2) issue #10, Ultra-Humanite makes use of Terra's geokinesis to bury Kara alive. She only needs a few seconds to escape. Justified because she's a Kryptonian, ergo she is super-strong and she doesn't need to breathe. The Girl of Steel is seen rising from her grave in the cover of Supergirl (Vol 5) issue #28. Four issues later, she has a nightmare where she's been buried alive and has to dig her way out of her grave. And in Supergirl Vol. 2 issue #20, Supergirl has to do this after Parasite seals her in a flying metal coffin. In one of the comics where Mickey Mouse is depicted as a hard-boiled detective, he was buried alive by the bad guys, in a fresh grave and without a coffin. He managed to cup some air in front of his face, but he only got a hand out under his own power, which was enough since the police were there by then and dug him up. In Dead@17, Nara Kilday claws her way out of her grave the second time she comes back from the dead. And in this case, she does have fairly super strength. The first time, she had already been exhumed when she woke up. Implicitly her friends reburied her after her second death. In the EC Comics story "The Thing from the Grave" (Tales from the Crypt #22), a murdered man rises from his grave to take revenge upon hearing The Scream of his widow. This is, in fact, not uncommon in EC comics and other pre-Comics Code horror comics. This happens with many of the dead mutants resurrected by Selene during Necrosha. For the most part she didn't even bother having them dug up; she just let them claw their way out of their graves on their own. Happens to Morbius. After Blade killed him, he was resurrected as an undead being. A friend was working on a cure and had just finished it when the combination of blood deprivation and sunlight felled Morbius. He was injected with the cure but as it didn't do anything his friends deduced he was actually dead this time, and buried him. The cure did turn out to work, it just took some time, which Morbius discovered when he woke up alive in his coffin and had to dig his way out. In one of the Hsu and Chan comics that ran in Electronic Gaming Monthly, the titular brothers find themselves in a graveyard as part of a video game themed haunted house and the corpses start to rise from their graves. It should be noted that the "corpses" are obsolete video game consoles. Quicken: Emma has to do this in chapter 2 when she comes back to life and realizes that she's lying inside a coffin. Since she healed any damage extremely quickly and didn't need to breathe thanks to her powers, the task was possible... but still extremely hard and painful. How the Light Gets In : When Laurel is resurrected by witchcraft, she's forced to do this. Described in horrifying and agonizing detail. By the time she gets to the surface, she's torn her knuckles, lost several fingernails, covered in cuts, lost a shoe, and her hair's a mess. Dean later reflects on what a horrifying and lasting trauma this is, see here, and true to his predictions Laurel is left noticeably traumatized by it. The difficulties of doing so are slightly addressed when Diggle asks how doing so could be possible, but Dean just replies "adrenaline". When Diggle protests that still doesn't make sense, Dean reminds him this is the supernatural and logic has no place in it.note Plus, it's later revealed the witches that revived her were planning on digging her up, but ran when they realized something had gone wrong. While not confirmed, it's possible they started to dig before realizing it, and as such made her job a bit easier. Creepshow. The title zombie in the first segment, "Father's Day". Happens to Eric Draven in The Crow when the title bird resurrects him. The Spirit (2008 film version) is shown doing this in a flashback. Don Diego de la Vega appears to die and is buried in The Mask of Zorro. As soon as his grave is left alone, he breaks out of it. The heroine Christine does this at what only appears to be the climax in Drag Me to Hell. The Return of Count Yorga start off Yorga commanding his buried vampire harem to rise from their graves, which they proceed to do from the local graveyard that an unfortunate child was playing in. Dead Snow: Herzog howls a command (to arise, not to Archvile...) and a whole horde of zombie nazis claw out of the snow. Done in The Brides of Dracula twice: First time is when Helsing goes to stake a recently bitten village girl. Only to find he's been beaten there by the Baron's human servant, Greta, who helps the now undead girl climb out of her grave and coffin. The second time, Gina, another victim of the Baron, is moved to the horse stable under Helsing's request. He takes too long getting there once again while Marianne, the lead female protagonist, goes over to pay her last respects. She's left alone as the locks suddenly drop from the casket, unbolted, and the now vampiric Gina pushes open the coffin's lid and sits up, smiling her fangs at Marianne. In the first Subspecies movie, one the protaginst, Mara, is bitten, dies of blood loss and buried. The vampire, Radu, visits her grave that night as she resurrects as a vampire and rises from the grave. The curse of Hillside Necropolis in Monster Brawl comes true as zombies start rising from their graves to show their displeasure of the outcome of the match between Frankenstein and Zombie Man, in which the latter dies. Dr. Thompson in The Plague of the Zombies has a nightmare where he sees the dead rising from their graves. The actual zombies in the film are very old-school variety of Voodoo Zombies. The Cabin in the Woods. The undead Buckner family when Dana inadvertently summons them, and the Ancient Ones at the end of the movie when a huge hand smashes through the eponymous cabin and comes down on the camera. Smash to Black. The Return of the Living Dead does this and is arguably the Trope Codifier if not the Trope Maker alongside its first sequel. When the local graveyards are doused with Trioxin gas, the dead start busting out of their eternal resting places. Guerrero has to do this when Satan sends him back to Earth in Dead in Tombstone. Fortunately it appears that his gang buried him shallow. Life Blood: Forty years after being transformed into a vampire, Brooke awakens and claws her way out of her shallow grave by the side of the road. Older Than Print: In medieval Europe, vampires were said to rise from their graves. Often, people took measures to find which bodies had already risen, and to prevent others from doing the same (such as lodging a brick in a corpse's mouth). Vampires were sometimes said to turn into mist and escape from a tiny hole, to explain why the ground hadn't been dug up. Windle Poons does this in Reaper Man. He's a zombie, more or less, but an intelligent one who thinks he ought to be dead, so he spends a fair amount of time lying in his coffin trying to actually be a corpse before he gets bored and gives up on the idea. Mentioned in Night Watch: Towards the end of the book, Vimes orders Reg Shoe buried - "but not too deep, he'll be wanting to come out in a few hours". The zombie later buries himself and rises from the grave every anniversary of his death, out of solidarity for his non-zombie comrades. In Stephen King's The Dark Half, this is the villain's origin. Protagonist Thad Beaumont decides to stop writing under his pseudonym of George Stark, and stages a mock funeral for him that includes a headstone. Stark later manifests himself by digging out of his fake grave. Galaxy of Fear: City of the Dead has Zak wake up in a coffin, buried alive. He couldn't get out, himself, but fortunately a bounty hunter knew where he'd been buried and dragged him out to question him. In Hungry as a Wolf, the town doctor is bitten by a screamer and succumbs to infection. After he is buried, he reanimates and claws his way out of his own grave as another screamer. Averted with his two victims, though, as they are burned on-site due to the horrific nature of the attack and the condition of the remains. In the short story Where there's a will... by Richard Matheson and Richard Christian Matheson, the protagonist has been Buried Alive, and refusing to give up, manages to break the coffin, push through the dirt and escape his grave. Then we find out just how much of a Determinator he really is; turns out he wasn't buried alive. Dan had to do this in Dan Shamble, Zombie P.I., as do some other zombies. It helps that in their world, coffins are required to be easily escapable from the inside. Misfits, similarly, showed the immortal Nathan trying to punch his way out of a coffin. "Uma Thurman did it, and she's just a girl." No luck - he had to be dug up. Buffy herself while temporarily a vampire in season 1's "Nightmares". Buffy claws her way out of her own grave in season 6 — upon her return to the living world, Spike notices the state of her (broken and dirt-stained) hands and realizes from his own vampiric experience that she dug herself out. In Supernatural, Dean in season 4. Addressed in the Discovery Channel program One Way Out. Escape artist Jonathan Goodwin got the trapdoor in his (oversized) coffin open, but ran out of somewhere to put the dirt long before he could get a large enough hole dug to get out. Averted on Heroes. You would expect the immortal Adam Munroe to eventually be able to work his way free of the coffin Hiro put him in but he doesn't. Well, he hasn't yet. Since he lacks any sort of Super Strength with his immortality, it could take a very, very long time. If he becomes dehydrated, he can feel free to pass out. On the other hand, played straight with Sylar/Nathan in season 4, but he had powers to help him out there. Happens in the CSI: New York episode "Boo" where a man who had faked his death with tetradetoxin and was buried alive smashes his way out of a jute coffin and claws his way to the surface where he is mistaken for a zombie. In the Smallville episode "Harvest", Clark Kent loses his powers while in a village filled with blue kryptonite. Eventually, the crazy villagers stab him in the gut and bury him. Once shielded by the dirt from the kryptonite, he gets his powers back, heals, and bursts from the grave. In Agents of S.H.I.E.L.D. Simmons finds herself doing this when she enters the Framework as her virtual version had been killed by HYDRA. Digging out of a mass grave no less. Subverted in Lost Girl, when Kenzi is brought back to life inside her coffin. Dyson and Lauren are informed of it happening, and are smart enough to realize Kenzi is still in her grave. Ultimately, they dig her up. Used in Lupe Fiasco's song "The Cool". The titular character wakes up some six months after he was killed. The first verse details how he was killed, his burial and his subsequent awakening. The second verse tells how he digged his way out, using his chain and even his own teeth to reach the surface. The third and final verse ends with him being mugged with the same gun that killed him. 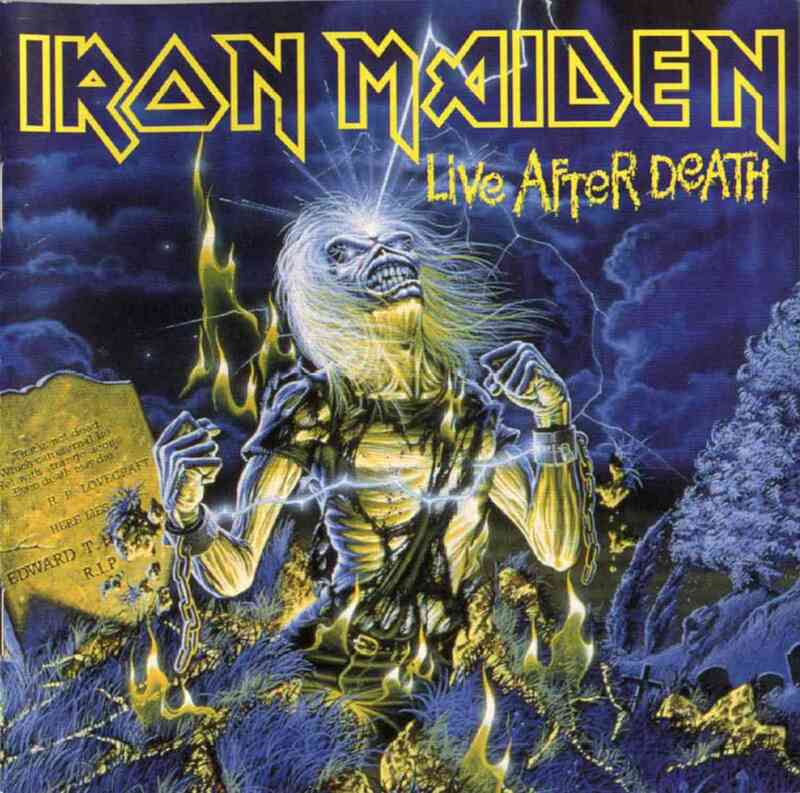 The cover for Iron Maiden's Live After Death ◊ has mascot Eddie doing this after being revived with lightning. The cover art for Darkness Descends by Dark Angel has three disembodied hands rising from their grave. The protagonist of Kreator's "Pleasure to Kill" rises from their grave to go on a murderous rampage. The zombies in Michael Jackson's Thriller. In Elvira and the Party Monsters, the player can make Elvira and Dracula pop out of their coffins. In Vampire: The Masquerade, the Sabbat use this as a recruiting technique when they need more foot soldiers. They abduct a bunch of random humans, turn them into vampires, whack them unconscious with a shovel (hence the term "shovelhead" for Sabbat vampires made this way) and bury them. If any of them are tough enough to make it out, the trauma and blood-starvation has usually made them crazy enough to join the Sabbat. A popular pastime for Sabbat vampires: take a shovel, find a grave with a failed inductee, dig them out, and try to kill them. Said failed inductees are usually mindless, Frenzy-driven maniacs, so it's a bit like wearing a suit made of steaks and walking through a tiger cage. The Trope Namer by way of Memetic Mutation, the old Sega arcade stand and cartridge Altered Beast has the player character being reanimated while Zeus appears in the sky with a crystal ball saying, "I command you to rise from your grave and rescue my daughter." Lightning then strikes your headstone, and your character pops out of the ground ready to brawl. The "Rise from your grave" portion of Zeus's message is said in audio, and the sound compression in the Genesis/Mega Drive version leads to a Narmy Elmuh Fudd Syndwome: "Wise fwom youw gwave!" Subverted for some enemies in MediEvil, at least in the graveyard area. If they aren't already roaming about when you get to them, their whole coffin rises out of the ground and they exit out easily. No enemy claws themselves out in the normal way. A Wizard Did It literally. In Warhammer 40,000: Dawn of War, Necron Flayed Ones (who ironically, prefer to flay enemies) appear like this when summoned onto the battlefield. Fallout: New Vegas started with you rescued from a shallow grave after being left for dead. When you finally catch up with the man who buried you, one of the possible things you can tell him is that you dug yourself out of the ground to come after him. Tales of Monkey Island: Parodied at the beginning of Chapter 5, when Guybrush wakes up as a Ghost Pirate in his own grave at the Crossroads' Gateway and believes he is "Buried Alive... again!" Brain Dead 13: In one of Lance's many death-and-resurrection sequences. In Batman: Arkham Asylum, Batman does this after the Joker shoots him in the forehead and the player chooses to retry in the fake "Game Over" scene, all in the Scarecrow's final Mind Screw segment. It took the Resident Evil series until the third game to do this. Jill has to make her way through a cemetery and wouldn't you know it? The dead won't stay dead. In Dragon's Dogma, The Undead crawls out from the ground at night, and in the catacomb. In Dark Souls II, Hollow Prisoners crawl out from the soil of Undead Crypt, and they respawn constantly. In Dark Souls III this is what happens to the Lords of Cinder when they're called to link the First Flame, and any Unkindled (such as the player character) who are called to hunt them. In The Elder Scrolls series backstory, dragons were all but rendered extinct by the late 1st Era. However, while anyone of sufficient ability can slay the physical body of a dragon, they possess Resurrective Immortality and can be brought back to life by another dragon unless their soul is absorbed by a fellow dragon (or Dragonborn). Come Skyrim, Alduin has escaped the timestream and is bringing the dragons back to life. Many are buried in dragon burial mounds throughout Skyrim, and it is possible to witness several literally rising from their graves. Similarly, the members of the Dragon Cult, a Religion of Evil which worshiped the dragons, were cursed with undeath for their crimes. They too are rising from their graves following Alduin's return in the form of Dragon Priests and Draugr. In a case of Super Strength, dragons burst out of their burial mounds in explosions of dirt, and draugr often announce their presence by shattering the stone lids of the sarcophagi. Miss.Loveworth from IronGate digs her way out of her grave upon returning as a vampire. Happens in Schlock Mercenary. Kevyn was buried in a shallow grave after having his throat ripped out on a primitive world. Fortunately, his blood-nannies managed to heal and revive him. Frans Rayner in The Adventures of Dr. McNinja. Victoria after coming back as a vampire in Charby the Vampirate. Parodied in the Whateley Universe webcomic Jobe Watch (NSFW) with a mad scientist's escaped Animate Body Part. Family Guy parodied this, with Mayor Adam West cementing over every grave in the cemetery... "You'll thank me when no one eats your brain. You'll thank me." The zombies in The Simpsons Halloween episode "Dial Z for Zombie" do this. Parodied in The Crumpets episode "Ghosts In The Attic" when the head of Ditzy (who is not dead and is wearing a wig and a table cloth) emerges from the bone-ridden earth . She frightens Ms. McBrisk at the right timing before reuniting with her body. Erich Weiss (Harry Houdini) did this once in real life, testing to see if it was worth adding to his regular escape routines. He got out of the restraints and buried coffin (collapsing the latter afterwards to make working space) and made it to the surface without aid. He never even attempted this again. Quoted: "The weight of the earth is crushing..."